takes in all of the nutrients that the body needs. and improved quality of life. intersects with the food/liquid carried by the other part of the small intestine. 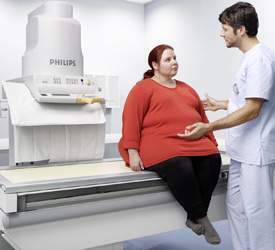 obesity-related medical problems often resolve after gastric bypass surgery as well. the top part of the stomach to cause a small stomach pouch on top of the band and a larger area below. to be reduced after gastric band procedures. Weight loss tends to be about 40 to 50% afterwards. patients to eat at near normal levels. Bariatric means pertaining to bariatics. Bariatrics comes from the Greek word "baros" meaning "weight"
and the "iatros" meaning "physician." Put the words together and you get "weight physician."